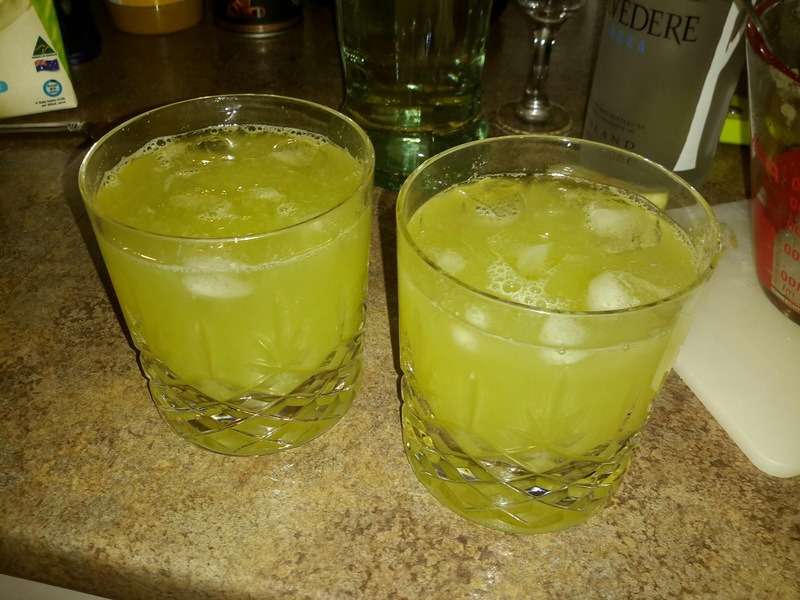 I just made some tasty cocktails with some of what I had available, so I'm writing it down before I forget, and hopefully it will make someone else happy if they make it and drink it. I'm calling it, egotistically, the Apple Craftini. Put about a dozen cubes of ice info a 600ml+ measuring jug. Blend a medium granny smith Apple with 40ml of extra dry vermouth. Push the apple mixture through a sieve into the measuring jug, making sure to scrape off the solids from the underside of the sieve into the jug. Add 80 more ml of vermouth, along with 120ml of vodka. Make sure the vodka is non-Russian, because of their anti-gay laws and totalitarian power structure. Add 120ml of a good apple cider - I used Cascade - and then stir it all thoroughly together. Serve out into two highball or large whisky glasses, including the ice. Feel free to garnish with some apple peel. I peeled off a bit, but forgot to put it on the glass.